Downtown Spokane from the Hutton Building, formerly owned by Rob Brewster. Brewster has lost many of his iconic Spokane buildings. Twenty-eight may seem a bit young to own a six-story building. But that’s how old developer Rob Brewster was, in 1998, when he purchased the Holley Mason building in downtown Spokane. 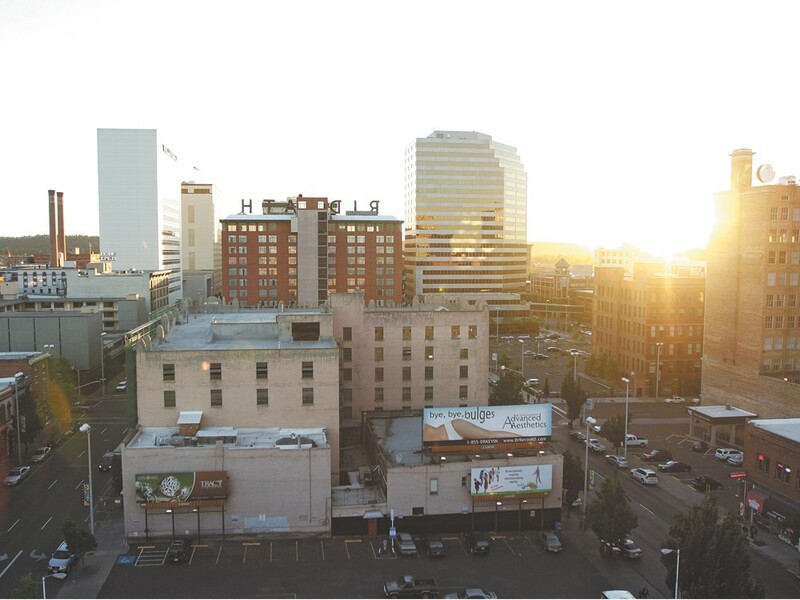 With that purchase Brewster began his rise — not only as a young real estate star, but a vital part of downtown Spokane’s renaissance. “When you find something that is fun to do, it’s amazing what you can make work,” Brewster says. His company, ConoverBond Development, turned the Holley Mason into Lewis and Clark High School for two years, while his alma mater was under construction. He built a residence hall at Eastern Washington University and named it after his grandmother. Those days are over. When air conditioning in the Hutton building died this summer, tenants (including the Inlander) found a notice in the elevator informing them that Brewster’s building had fallen into bankruptcy and had been foreclosed upon. The parking lot in the Havermale block is still a parking lot, and the buildings, facing foreclosure, were returned to the bank. Two weeks ago, Brewster officially lost the Holley Mason building. “It’s not fun,” Brewster says, laughing at the understatement. The fourth floor is mostly empty and the vacant fifth floor — carpets torn out — is between tenants. At the ConoverBond website you can still find the 2004 Spokesman-Review profile on Brewster, lengthy with fellow developers praising Brewster’s risk-taking vision. Call the ConoverBond phone number, and it’s disconnected. Today, Brewster only has one major building left in Spokane — the Montvale Hotel — and he’s questioning his career as a developer. Brewster’s struggles underscore problems not only with the national economy, but with the business climate in Spokane. Even before the recession, Brewster, a self-described optimist, had soured on Spokane. He alludes to a personal issue, but won’t say more. He says he was bothered by the impact of the scandal surrounding former Mayor Jim West, who was outed as gay and recalled from office. He remembers comparing the attitudes toward development among a Spokane South Hill neighborhood with those in Portland. Spokane neighbors were extremely negative, worrying there wouldn’t be enough parking spaces and that the increase in traffic would put their kids in danger. That opposition helped kill his project. But in Portland, when he said there wouldn’t be any parking, the neighbors sighed in relief. Ultimately, Brewster moved away from Spokane, focusing on developments in Portland and Seattle. But he remained invested in Spokane, even as it became more difficult to compete. Brewster places some of the blame for Spokane’s struggling market at the feet of one of its most successful developers: Walt Worthy. Many partially credit the Davenport developer with the revitalization of Spokane’s downtown, but Brewster believes he made it tougher to survive in the urban core. Worthy’s Rock Pointe Corporate Center (which he has since sold), north of the Spokane River, and his River View Corporate Center, in Spokane Valley, attracted business away from downtown. His low initial rent prices skewed tenant expectations, Brewster says. “When Walt Worthy built Rock Pointe it had an incredibly negative impact on downtown Spokane,” Brewster says. An interview request to Worthy on Monday was not returned. Worthy also affected Brewster’s business more directly. He assisted Inland Northwest Health Services, the Holley Mason building’s largest tenant, into leaving and relocating into the Wells Fargo building. It left a gaping vacancy. Then the recession hit and office vacancies got a lot bigger. For Brewster, the Holley Mason building was victim of a disastrous convergence. In 2010, one tenant — Cricket Wireless — downsized its space by a third. West Communications, a major call center company, went from paying $15 per square foot to $11.75. All told, rent declined by $18,000. At the same time, the initial 10-year property tax discount deal with the city ended, causing the taxes to nearly quadruple. As layoffs rippled through the community, downsized businesses needed less office space. The owners of the nicest buildings could lower their rents and persuade surviving businesses in low-quality buildings to upgrade to their better accommodations. But office buildings of lower quality ended up with massive vacancies. In the downtown Spokane area, surveys reveal, the lower quality “class C” office buildings were more than 27 percent vacant. But Ron Wells, a developer who’s advised and praised Brewster, says the economy is not entirely to blame. Ultimately, Wells says, Brewster had too many projects and too much debt. That made it hard to survive a run of bad luck. A state database shows that Brewster has been in charge of more than 30 different limited liability corporations: from Launchpad Productions and Matador, to Pacific Commercial Development. Bill Kalivas, founder of Launchpad Inland Northwest, also worked with Brewster in the early days. He says Brewster was a risk-taker in a community that doesn’t like to take risks. “Spokane is not a very forgiving town that way,” he says. Spokane is a town with a very low average income, employers complain, in a state with one of the highest minimum wages. “I can’t tell you how difficult it is to meet payroll every month,” says Kalivas, who adds that he’s trying to address these problem. He’s working on a plan to connect new businesses with established mentors, and he’s working with building owners, asking them to donate vacant office spaces, rent-free, to new businesses for six months. Hopefully, it would solve two problems — vacancies and lack of business — at once. By far, Brewster says, Spokane is the worst market he’s in. But he’s had troubles in Seattle and Portland as well. An Oregonian article in March focused on complaints from the tenants — unfinished work, cracks in walls, unpaid utility bills, and nosiy construction — in his new office building in Portland’s Pearl District. He’s admitted hiccups, he told the Oregonian, and worked to address them. As much as he loves the real estate business, he’s been thinking a lot about his career and whether he wants a change. It isn’t an easy question. “The irony of all of it,” Brewster says, “is that at 42, I would be a hell of a lot better at real estate now than when I started.” Looking back, he says he trusted some people that he shouldn’t have trusted. That was a mistake. Brewster recalls advice from Joe Dinnison, who he calls a pioneer in refurbishing downtown Spokane’s buildings.